Dr Rebecca Lawrence MRCVS returned to St Helena in August 2018 as the first qualified St Helenian Vet. Since returning from studying in the UK, Rebecca has taken up the position of Veterinary Officer and has recently commenced work at the Veterinary Section of the Agriculture & Natural Resources Division (ANRD). Currently, Rebecca is adjusting back to Island life and is working alongside of Locum Senior Veterinary Officer, Joe Hollins. 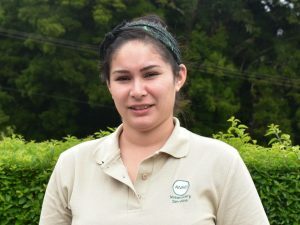 So far, Rebecca has dealt with various animal cases, conducted the Animal Clinics and is currently gaining further experience by working with farm animals. Rebecca worked with the Veterinary and Livestock Section of ANRD on a yearlong placement in 2011, where she acquired the necessary experience needed to secure a placement on a Veterinary Course. After completing a year’s training on-Island, Rebecca was awarded a Commonwealth Scholarship which allowed her the opportunity to study in the UK and to become a UK qualified veterinary surgeon. Rebecca began her journey in August 2012 studying towards a degree in Veterinary Medicine and Surgery at The University of Nottingham, School of Veterinary Medicine and Science. This course, which was five years long, included work experience placements on farms in the UK in the first two years and then placements in veterinary practices as the course progressed alongside university teaching. The final year of the course took place on rotation, meaning Rebecca spent a year rotating around various veterinary facilities. Rebecca successfully graduated attaining a Bachelors in Veterinary Medicine and Surgery in July 2017. After graduating, Rebecca worked in a small animal veterinary practice in the UK.